WASHINGTON PLACE WELCOME: Gov. Ige and the first lady want to welcome the public to more Washington Place events. Kamaile Academy students were part of the recent Hawai’i Tourism Authority’s ‘Ahamele series. “Lucky we live Hawai‘i” is more than just a catchphrase. As the holidays approach, Capitol Connection highlights some of the good work by the people of our state, the service of those who fought for our freedoms, and the progress we are making together for a better future. Q: What accomplishments are you proudest of from the past year? We’ve also achieved the highest ever bond ratings for the state, which means we can deliver more projects at lower cost. In addition, we’ve made significant progress in key areas of housing and homelessness, our Sustainable Hawai‘i plan for energy self-sufficiency and protecting our oceans and watersheds, and fiscal accountability to manage taxpayer funds better. Q: What are some of your highest priorities for the coming year? A: It will be about investing in our people — in education and jobs, housing, health and the environment — and continuing our work to make life in Hawai‘i better. I believe we have to challenge the status quo to make things happen. Government needs to be about change because the world is changing, and we cannot operate as we have in the past. Q: What personal significance does the Pearl Harbor 75th anniversary have for you and the first lady — especially since both your fathers served in WWII? A: As we all know, the attack on Pearl Harbor changed Hawai‘i and the world forever. Like others, our fathers decided it was important to prove their loyalty to America through their military service and defend our freedoms — even if it meant risking their lives. Q: Now that the presidential election is over, do you worry about the divisiveness that emerged during the campaign? What do you think this means for Hawai‘i? A: This is Hawai‘i’s opportunity to lead by example. We celebrate diversity better than any other state because we encourage people to be proud of who they are and where they came from and to share that with others. With our Native Hawaiian gift of aloha, this is our chance to show how a multi-cultural community can work. Gov. 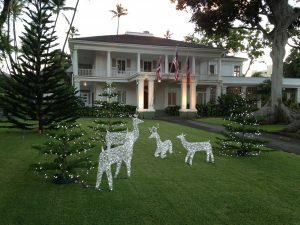 David Ige and first lady Dawn Amano-Ige, together with the Washington Place Foundation, will host a Christmas Open House on Dec. 11 from 5 to 8 p.m. Multiple decorated trees will be on display. At 6:30 p.m. Ballet Hawaii will present costumes from its Royal Nutcracker show. Reservations are required by calling 586-0248 or visiting washingtonplacefoundation.org. by Wednesday, Dec. 8.